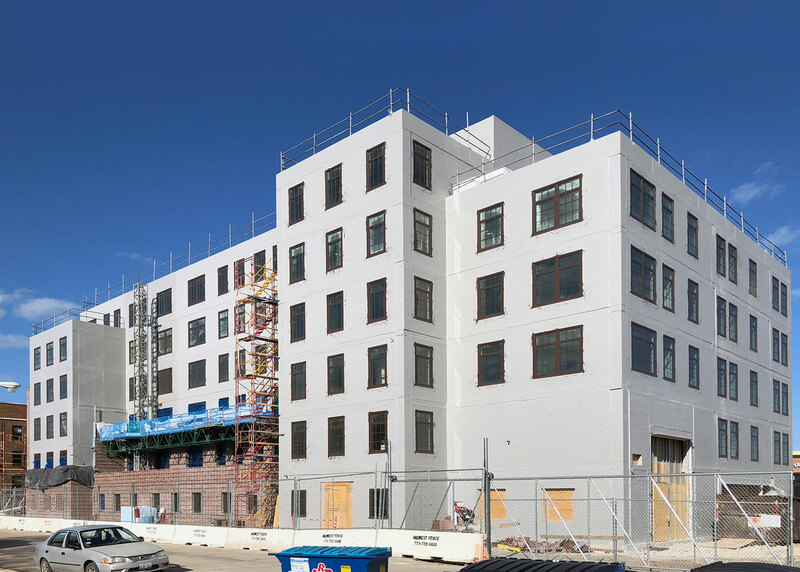 This 5-story residential building is in an area that is currently undergoing a transformation with multiple new developments. 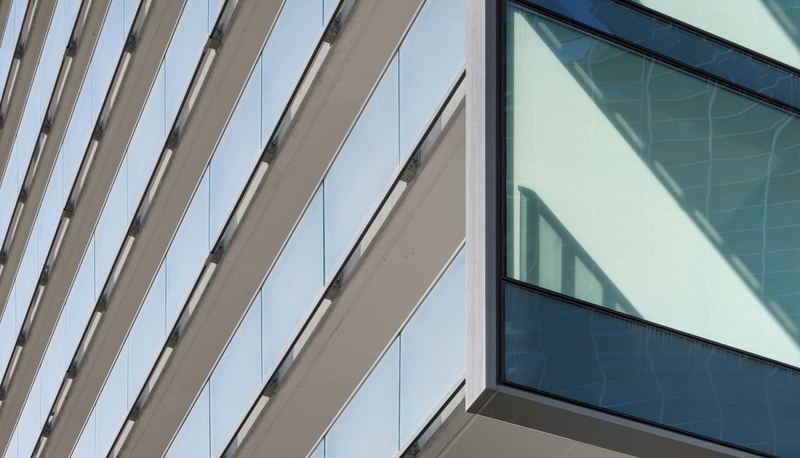 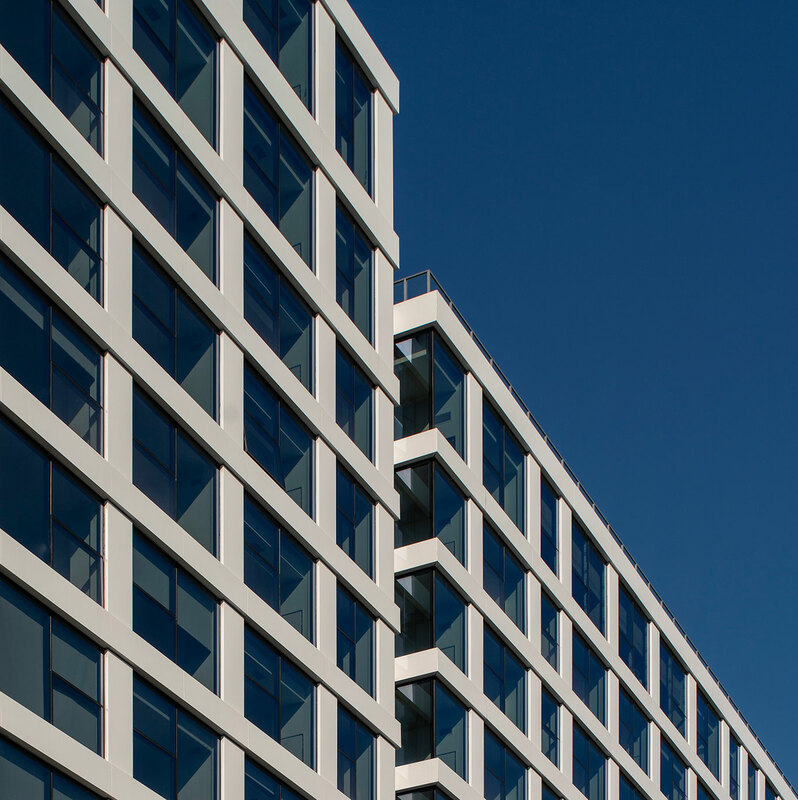 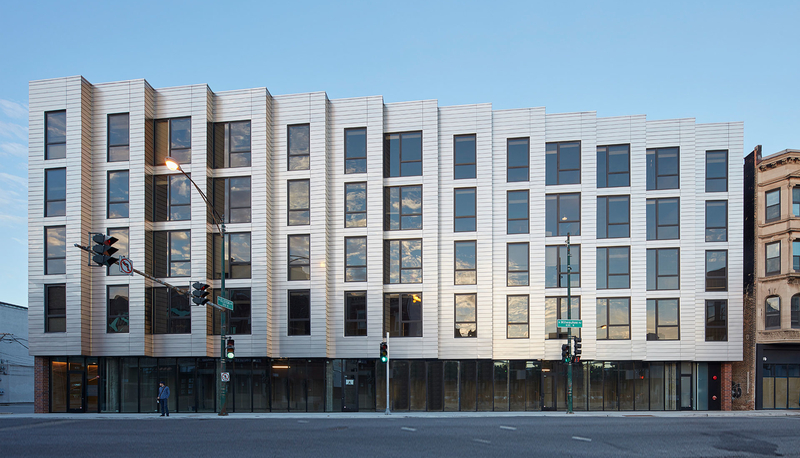 The exposure of the site at a prime intersection provided the opportunity to develop a striking façade design. 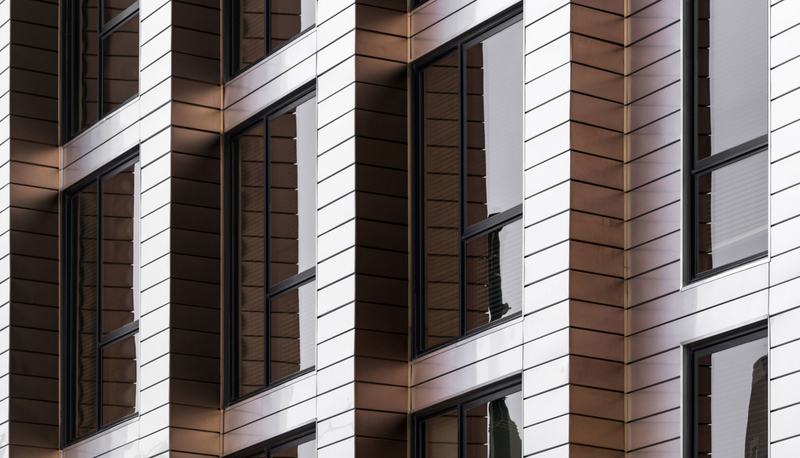 Stainless steel panels clad the sawtooth design in a contemporary and contextual application, allowing for a different architectural experience as one passes the building. 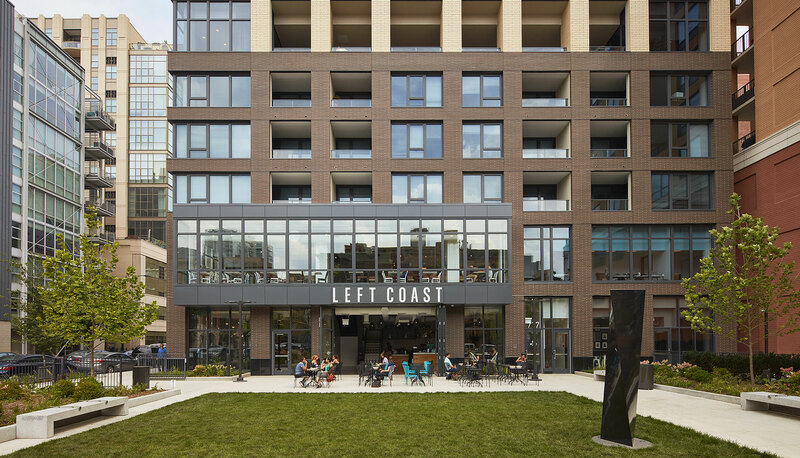 The building contains 47 rental units, ground floor retail space and parking. 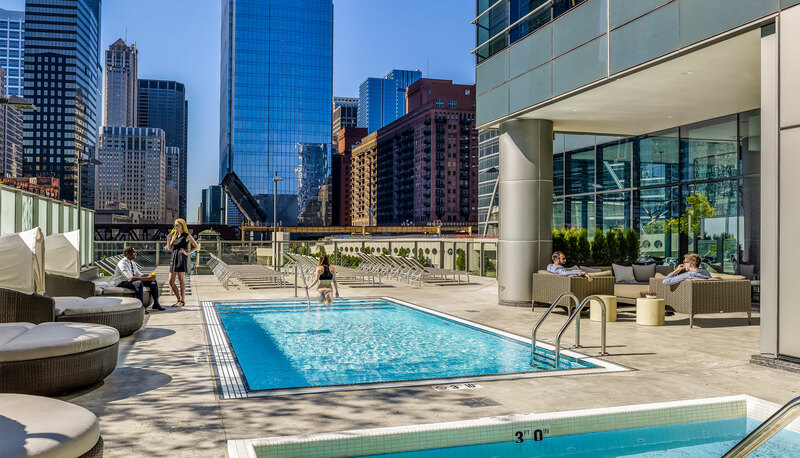 A community room and shared amenity terrace are located to take advantage of views to downtown. 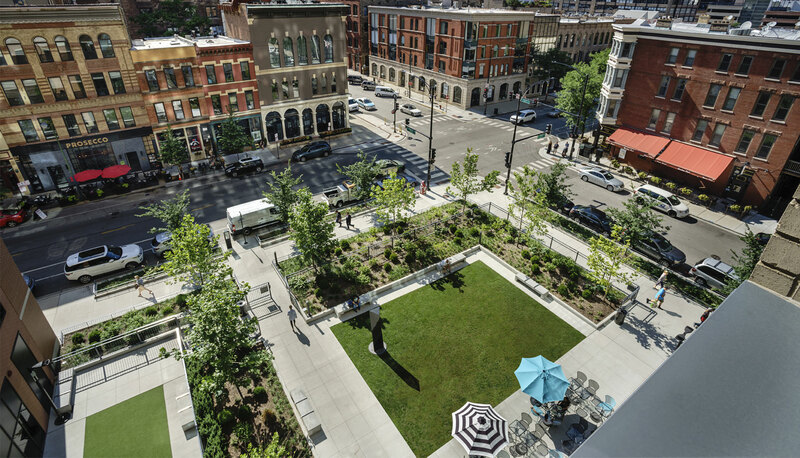 Close proximity to public transportation allowed the parking count to be reduced by 50% by taking advantage of guidelines for Transit Oriented Design as outlined in the current Chicago Zoning Ordinance. 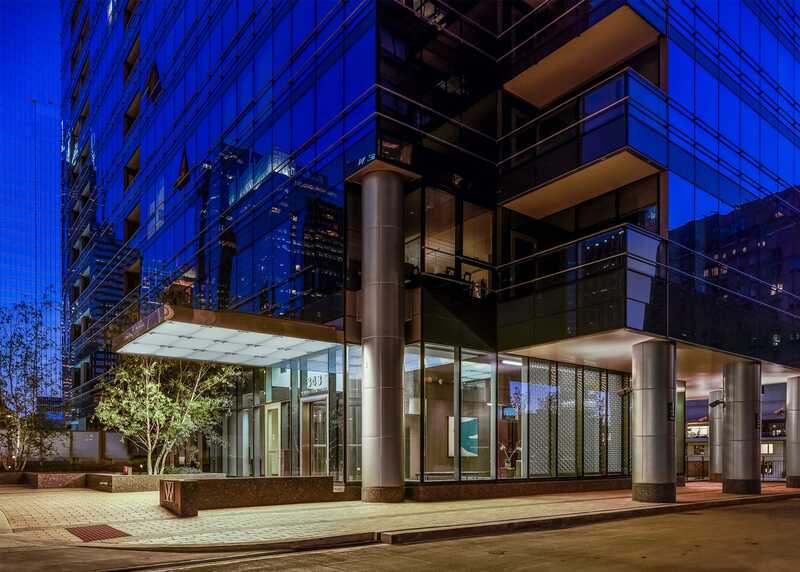 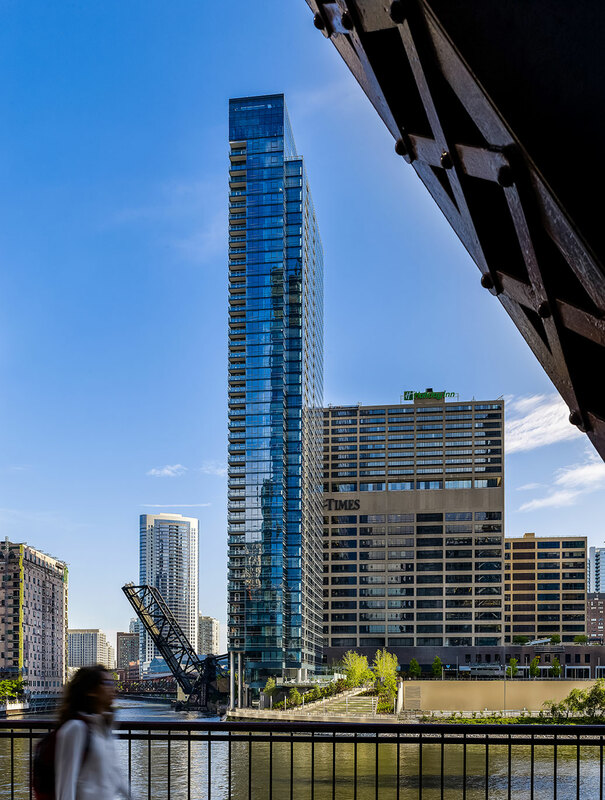 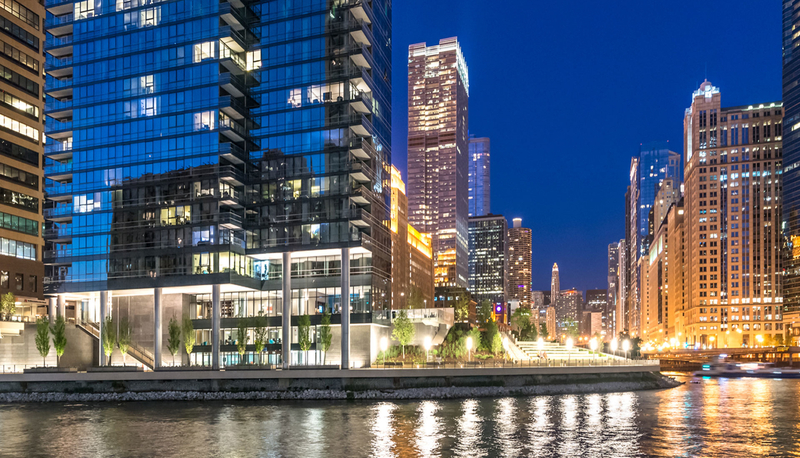 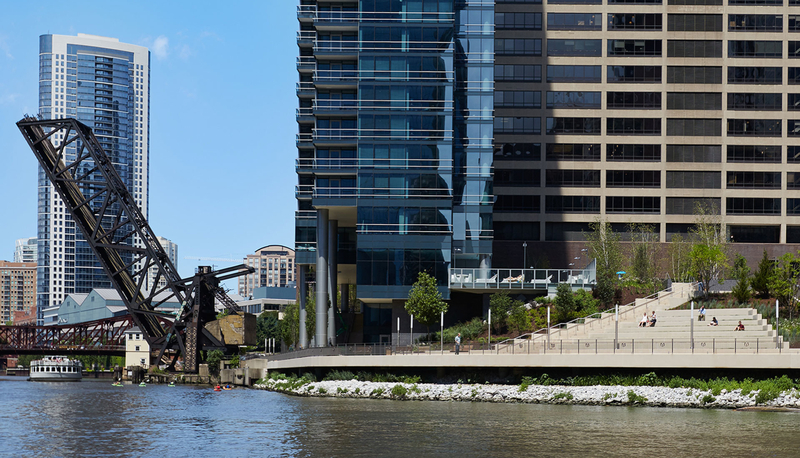 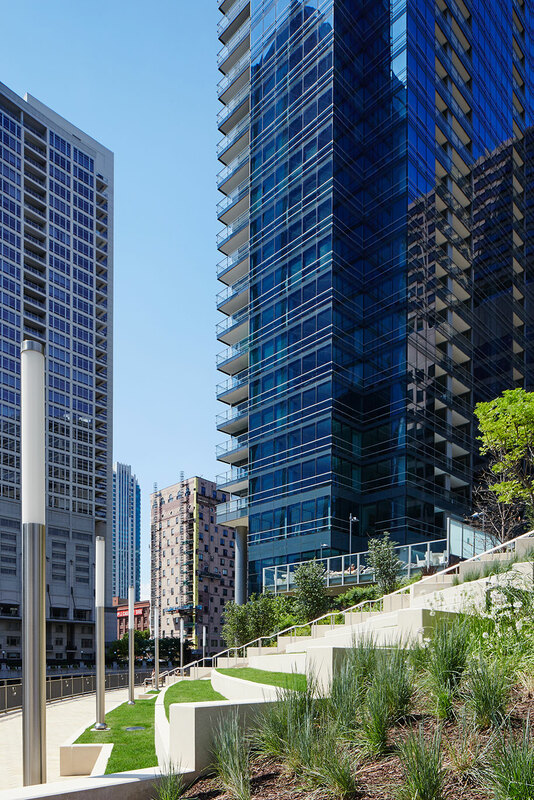 This modern glass and masonry residential tower was inspired by the historical buildings in its surrounding River North neighborhood. 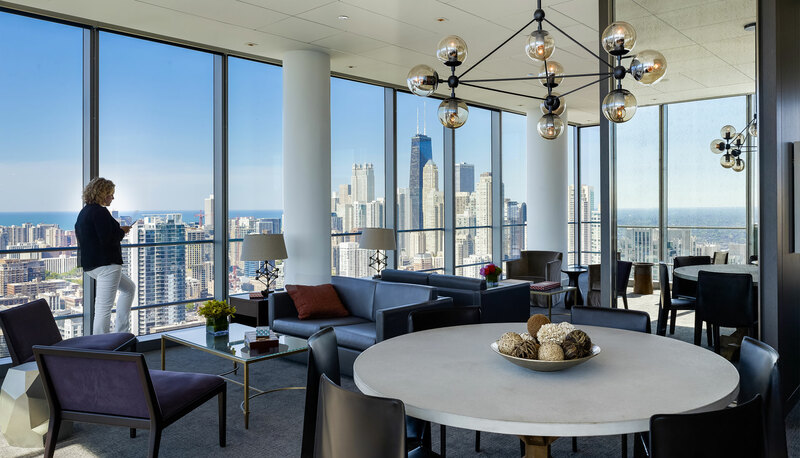 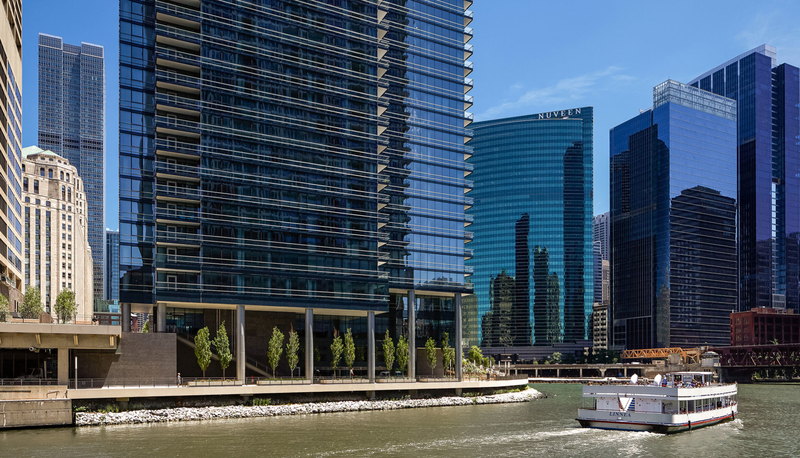 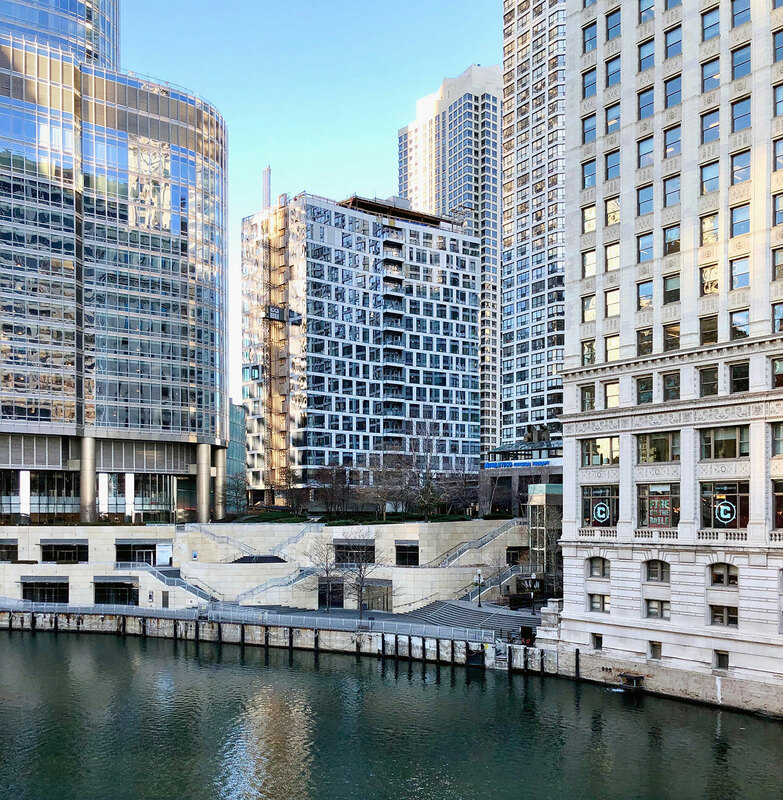 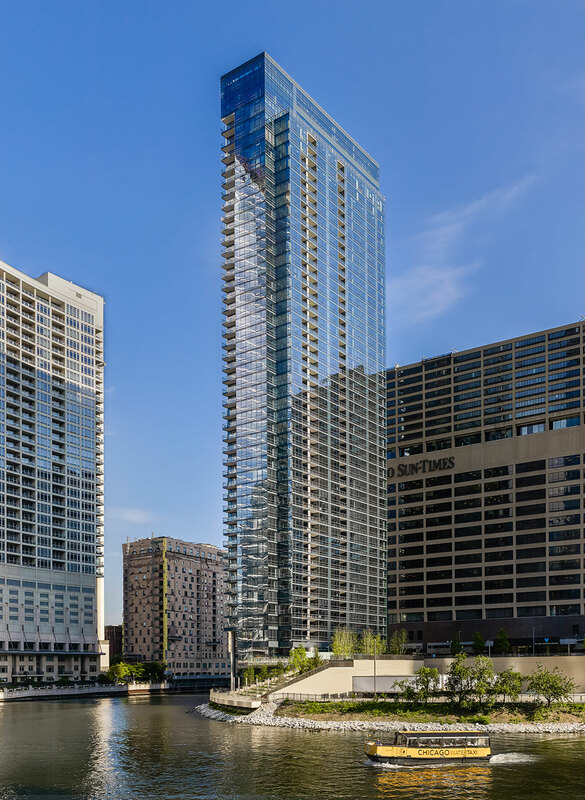 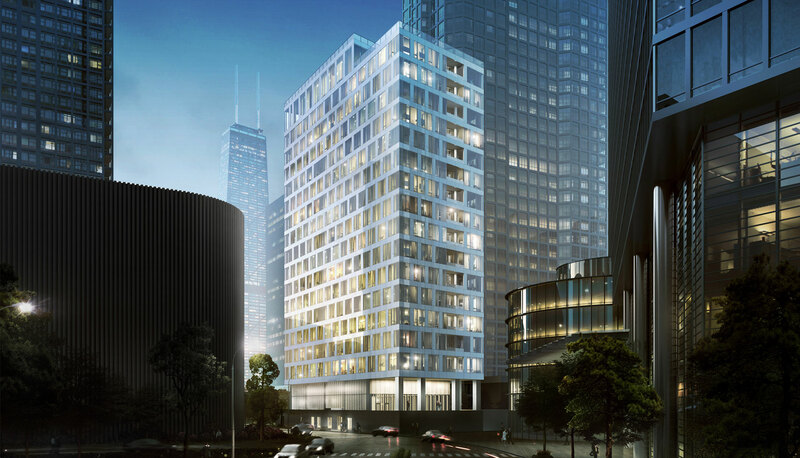 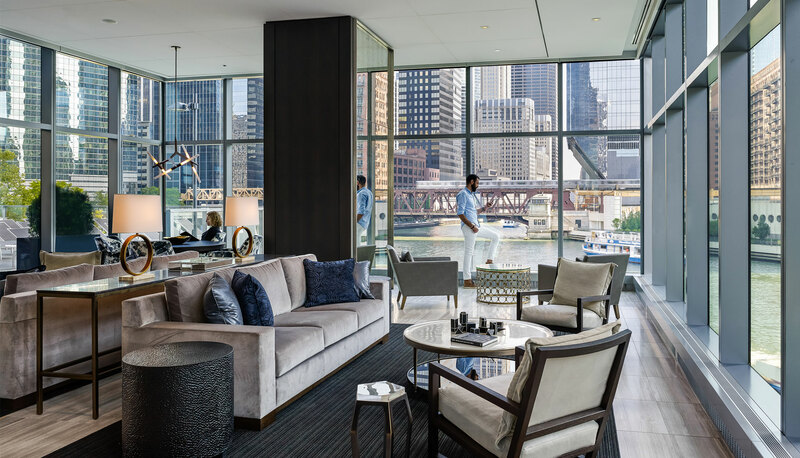 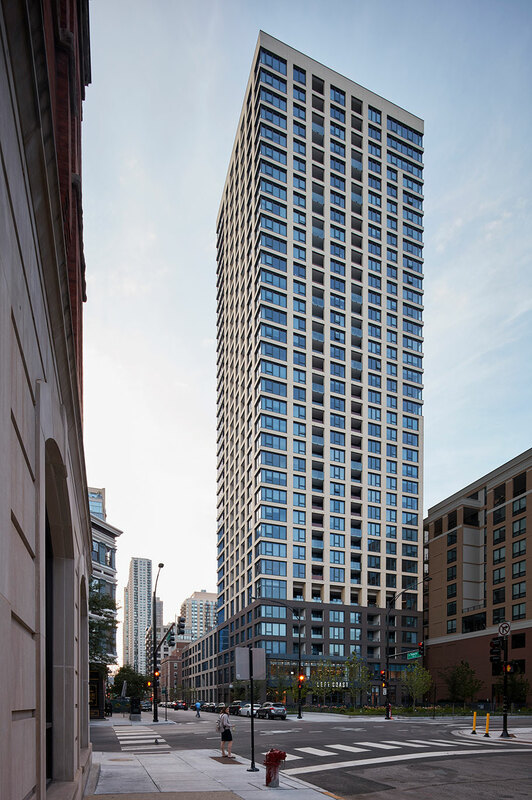 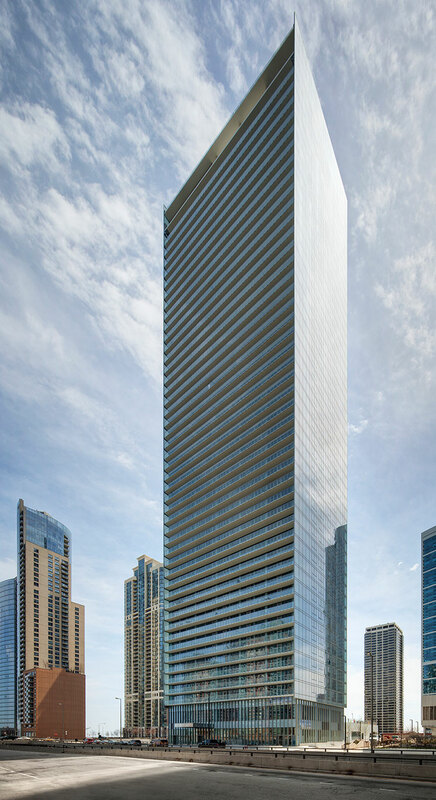 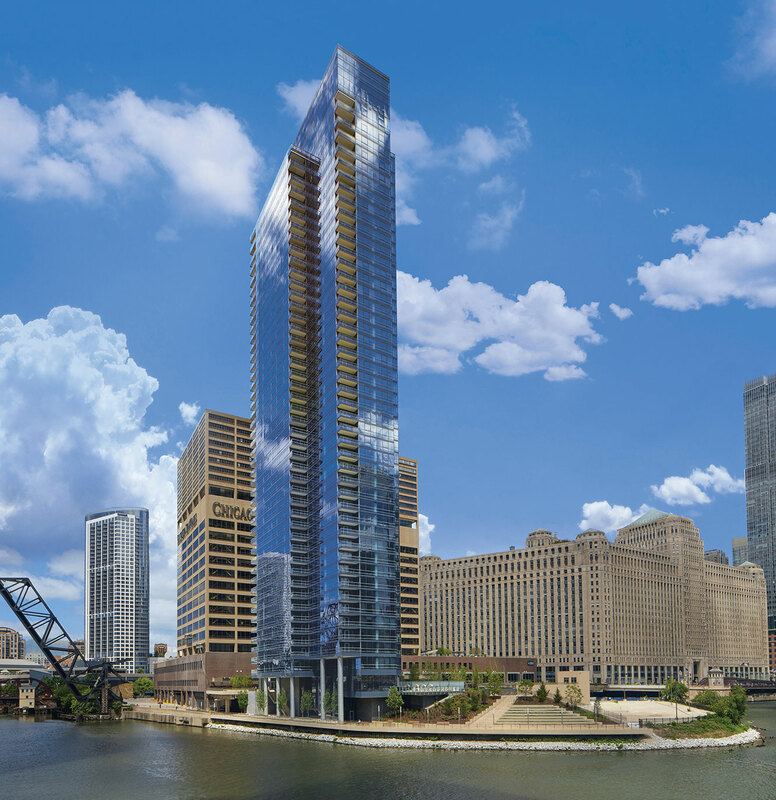 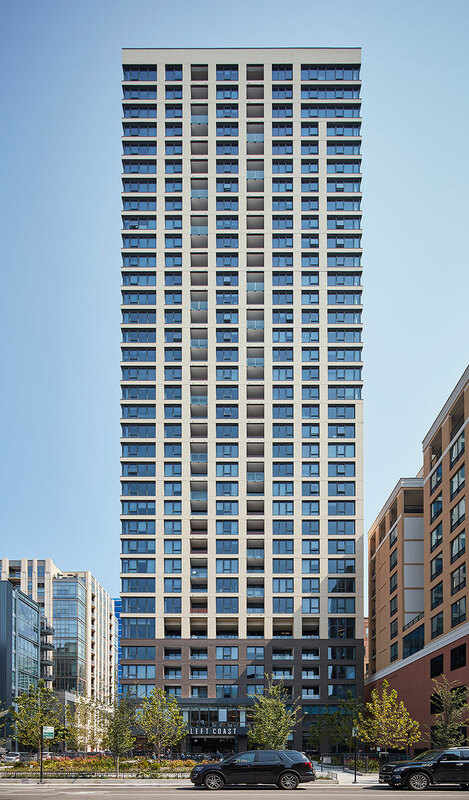 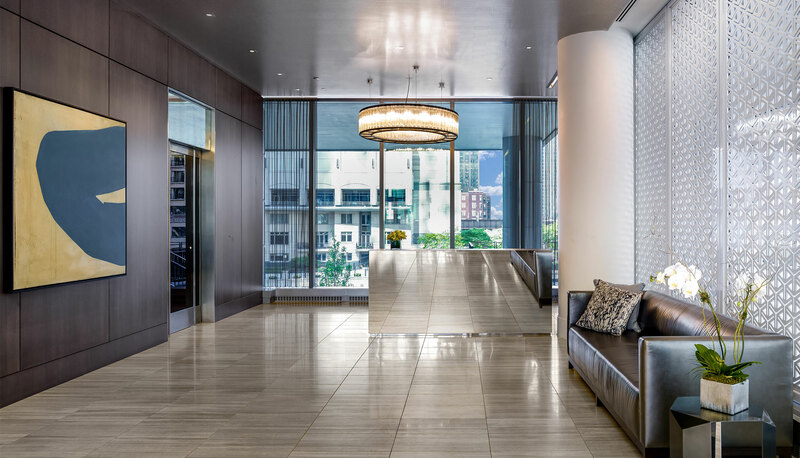 Bordered on the north by Superior Street, on the west by Wells Street and on the east by LaSalle Street, the site includes a 34-story rental apartment tower with a 5-story podium. 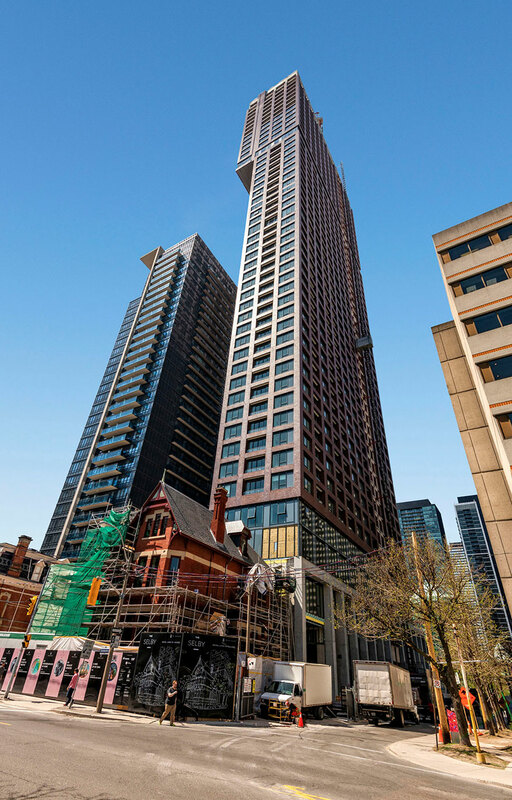 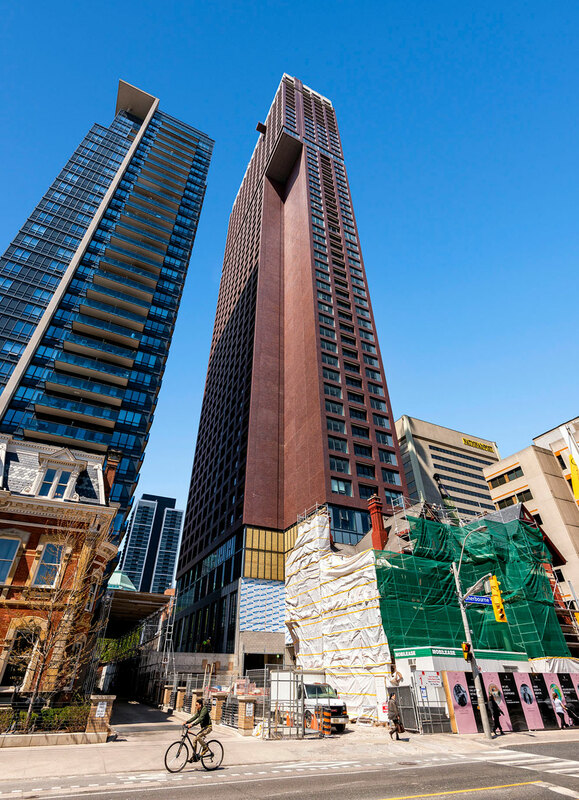 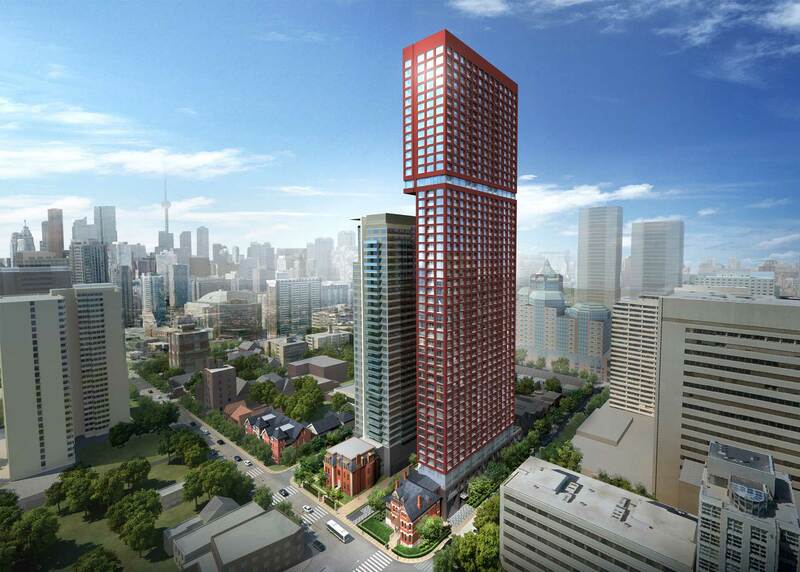 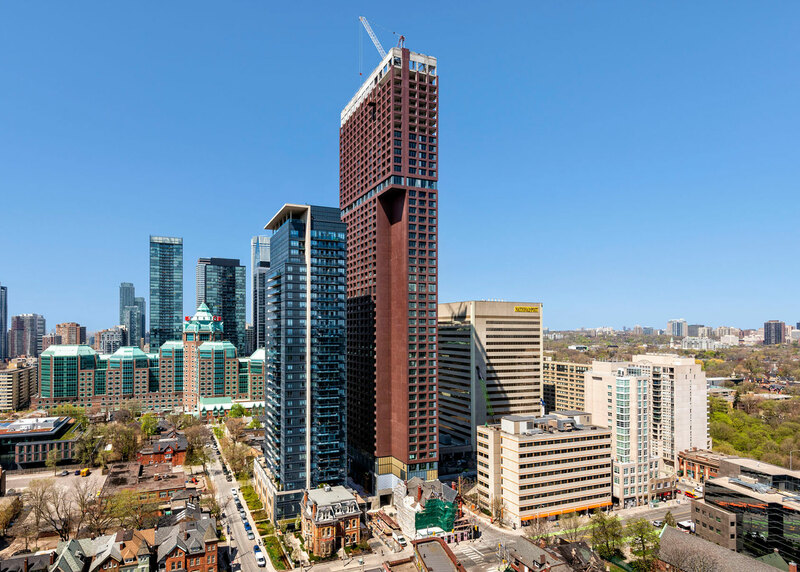 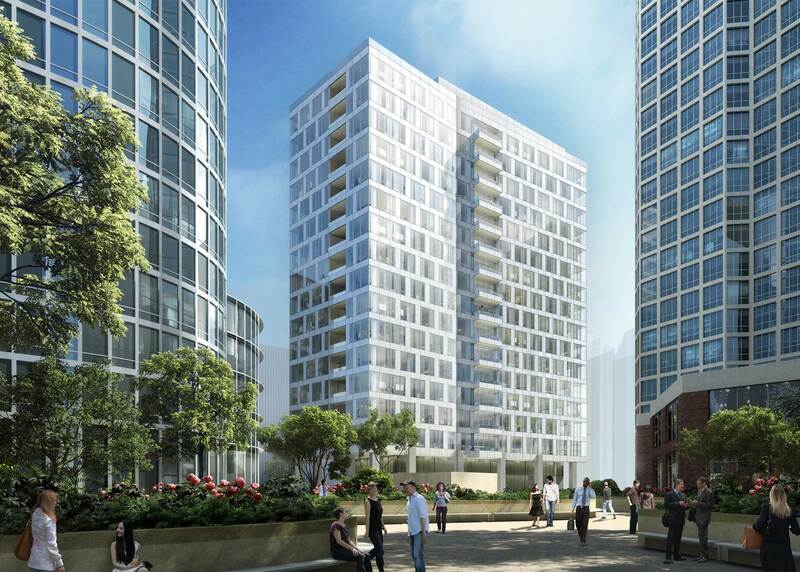 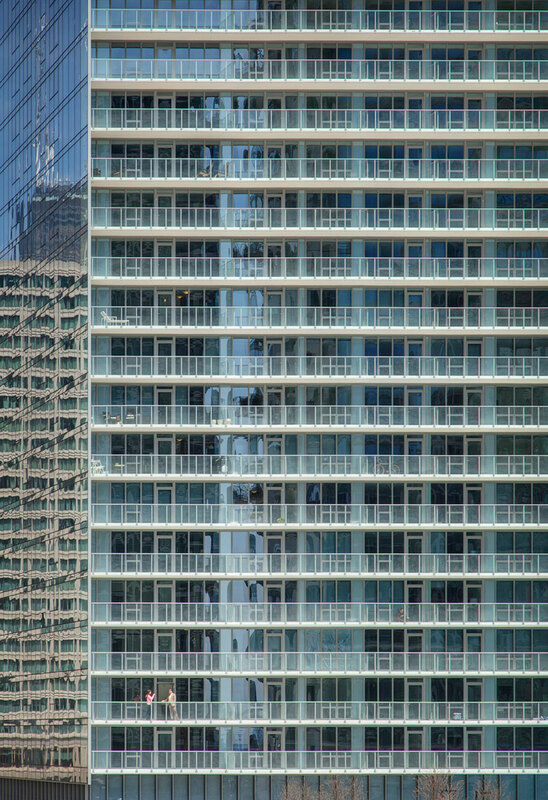 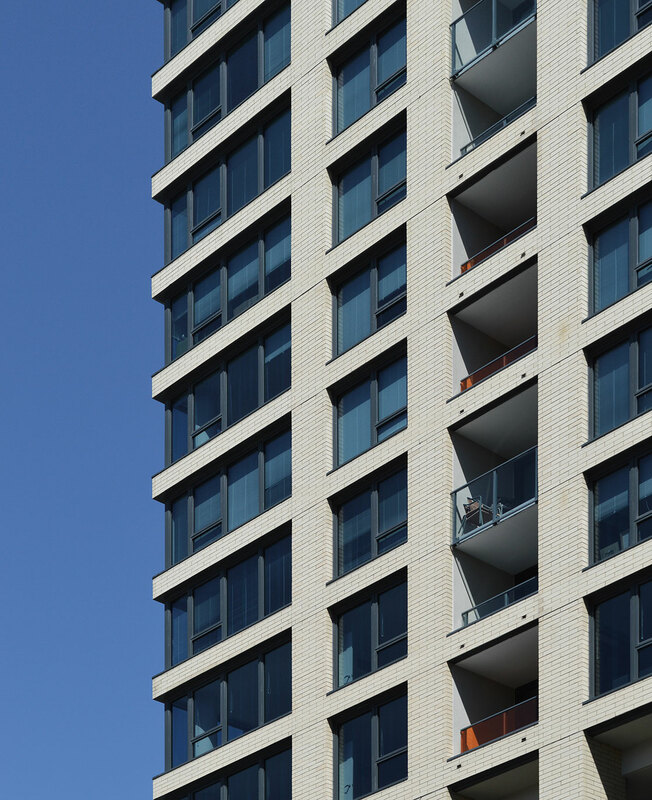 The 298 residential units occupy the tower and portions of the podium. 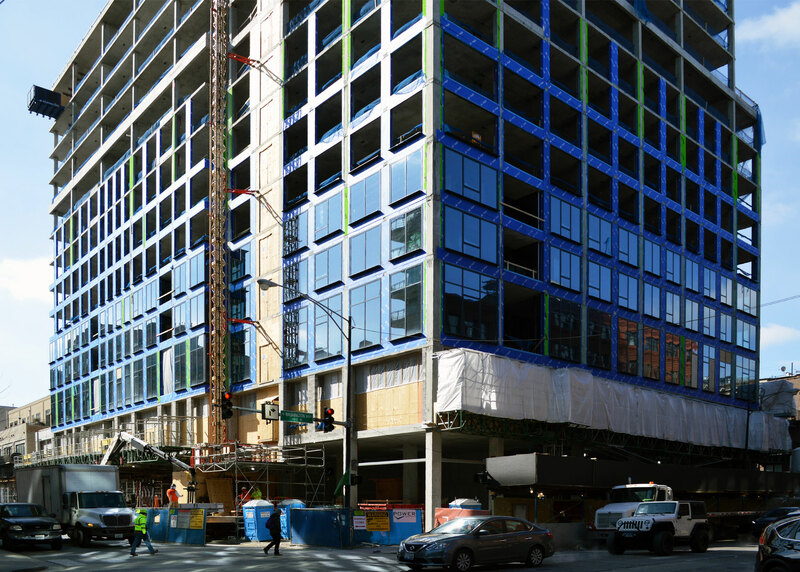 Wrapping the perimeter of the second and third levels of the podium, they buffer the parking levels from the street. 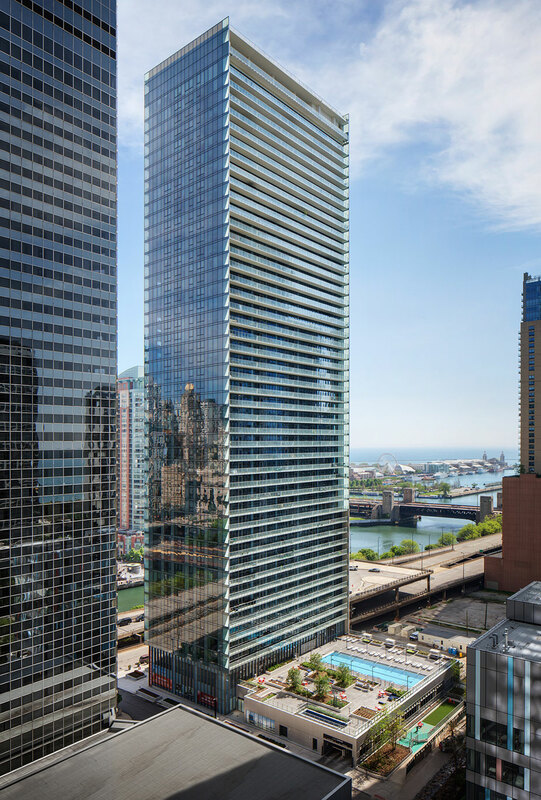 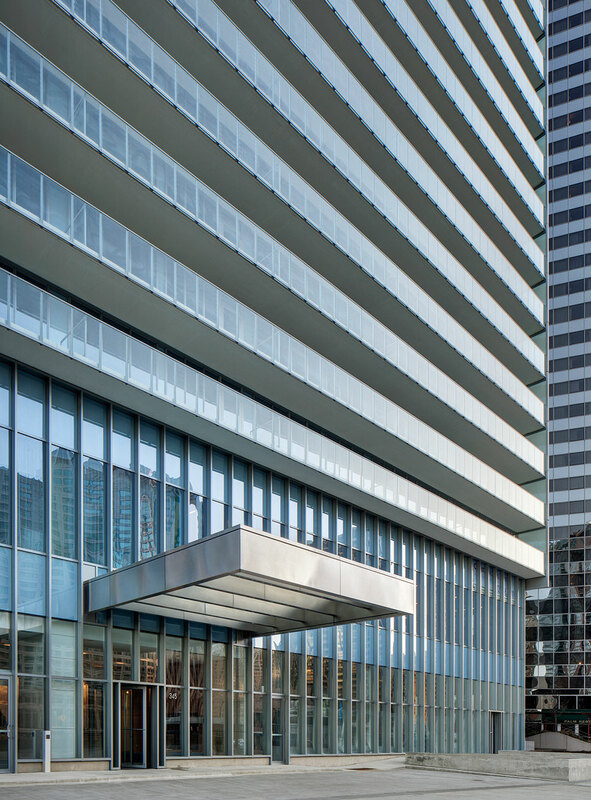 In addition to the residential lobby, the ground level of the building consists of retail space with frontage on LaSalle and Superior streets, as well as a smaller retail space adjacent to the park. 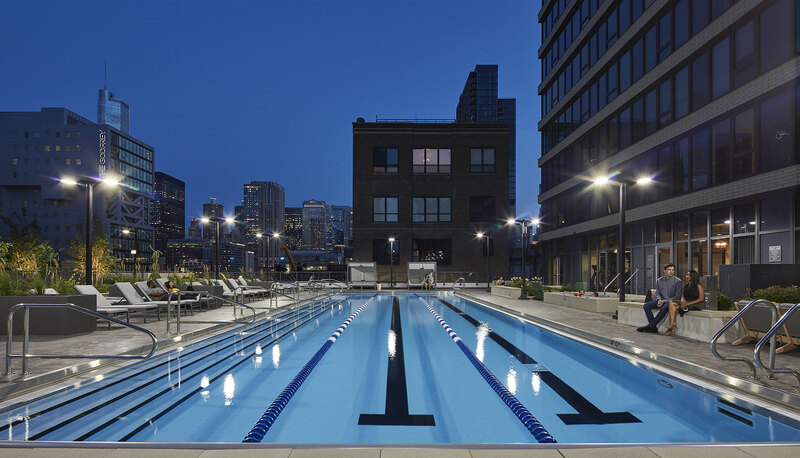 A fitness center, lounge and spa areas have direct access to the landscaped podium roof deck and outdoor lap pool. 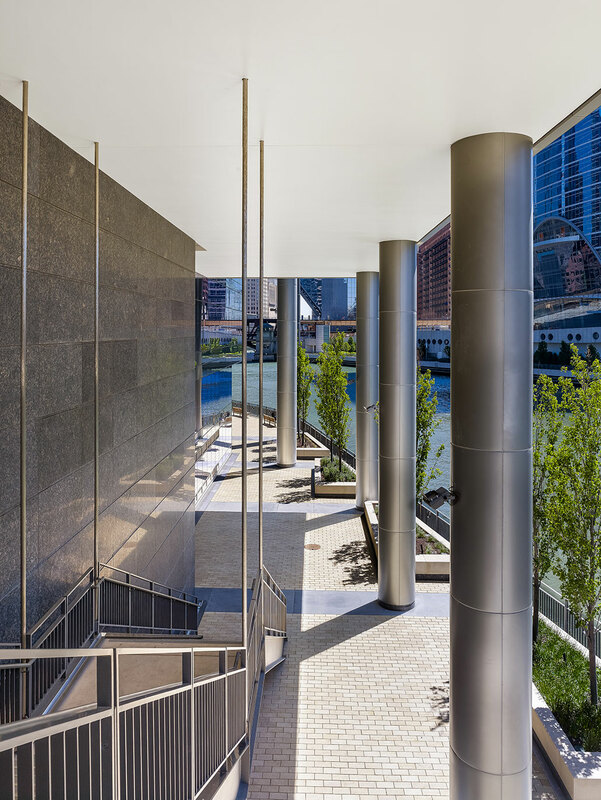 The semi-public parking garage—providing 109 parking spots—is located on levels 3 and 4 of the podium. 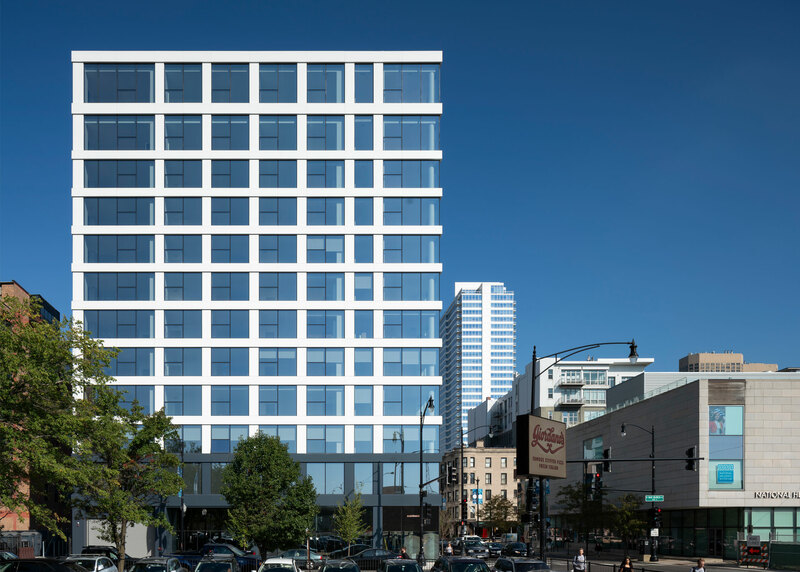 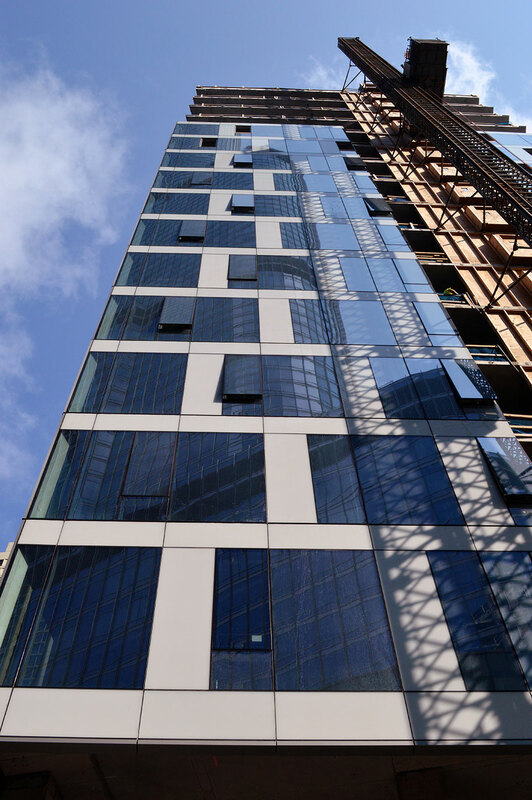 This new 12-story residential building, comprised of vision glass and white metal panels, is inspired by its Grecian neighborhood and driven by its underlying relationship with light and shadow. 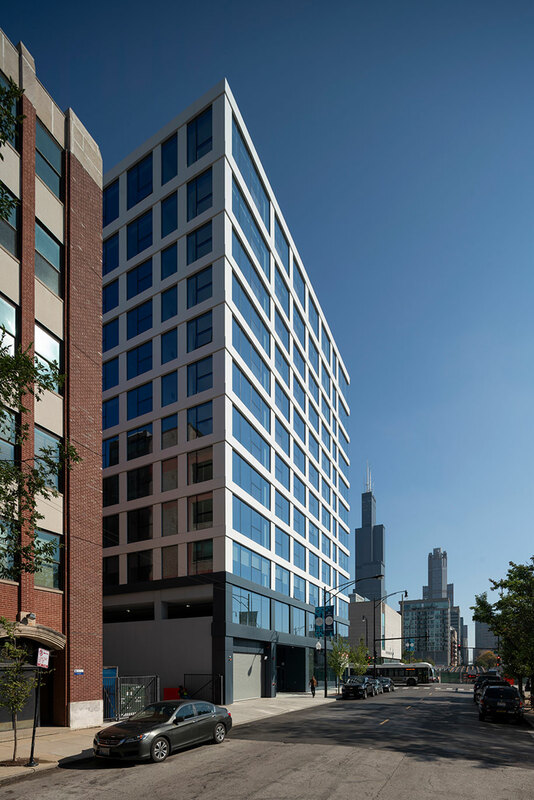 A modernist composition of offset horizontal and vertical panels lends to its visual depth thereby creating an intentional presence at the gateway to Chicago’s Greektown neighborhood. 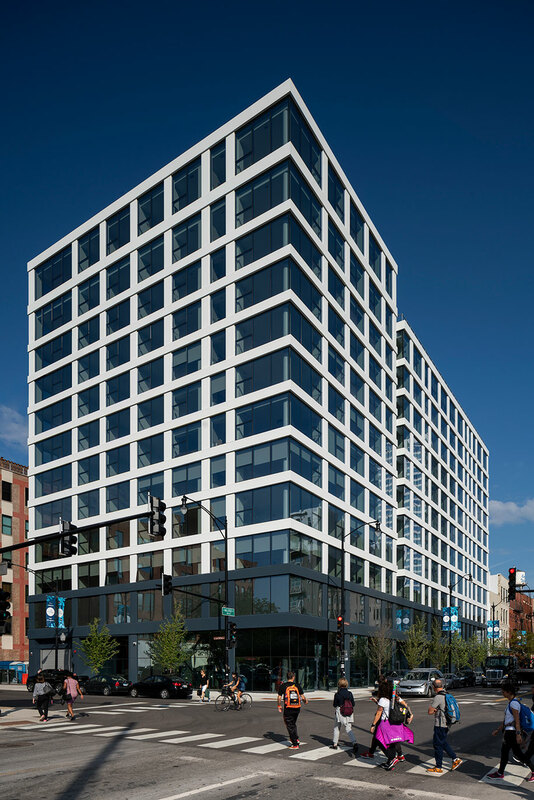 Set against its bright white frame, a deep blue retail base creates a strong, striking visual contrast upon Halsted Street, allowing for the possibility of street front activation. 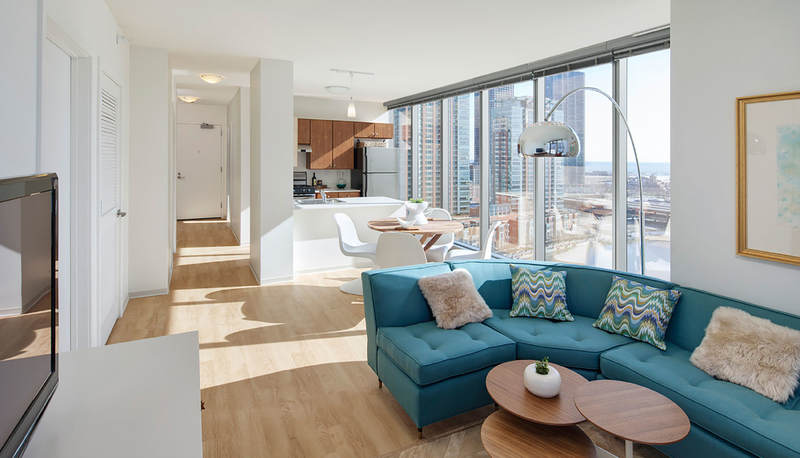 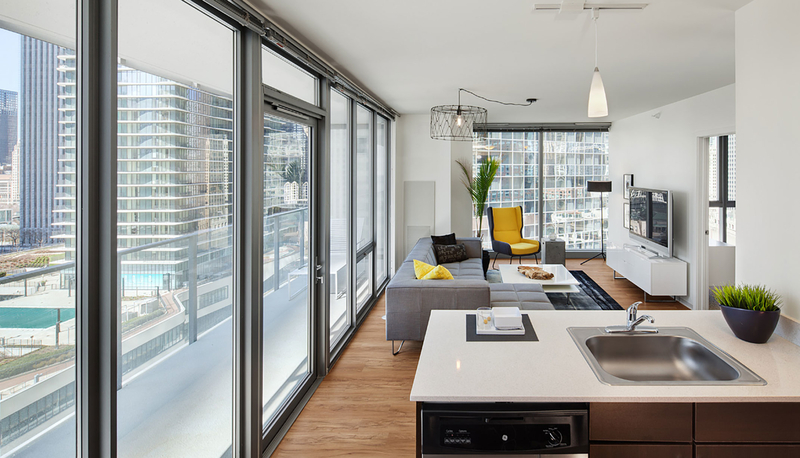 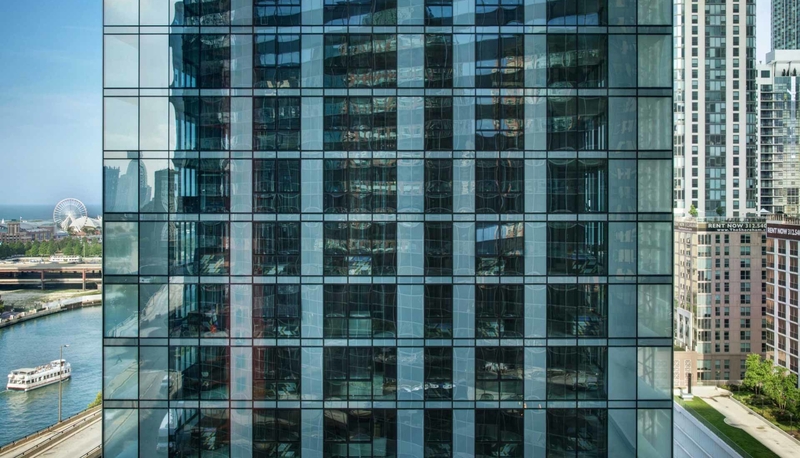 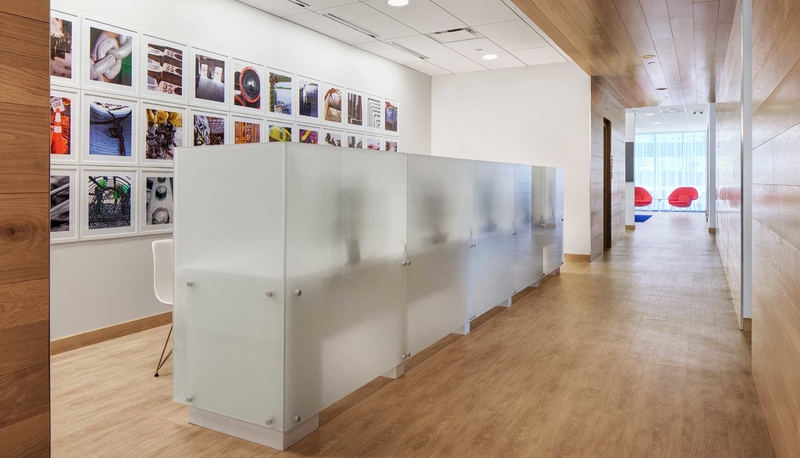 Containing 148 rental units, floor plans were designed in response to the massing of the building, which provides transparency with its deliberate glass corners and framed window wall system. 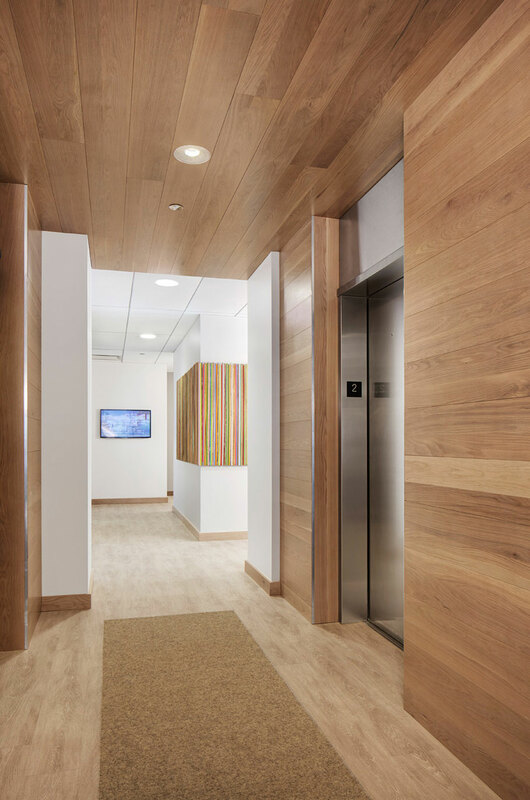 This approach translates to the functional layout of each floor. 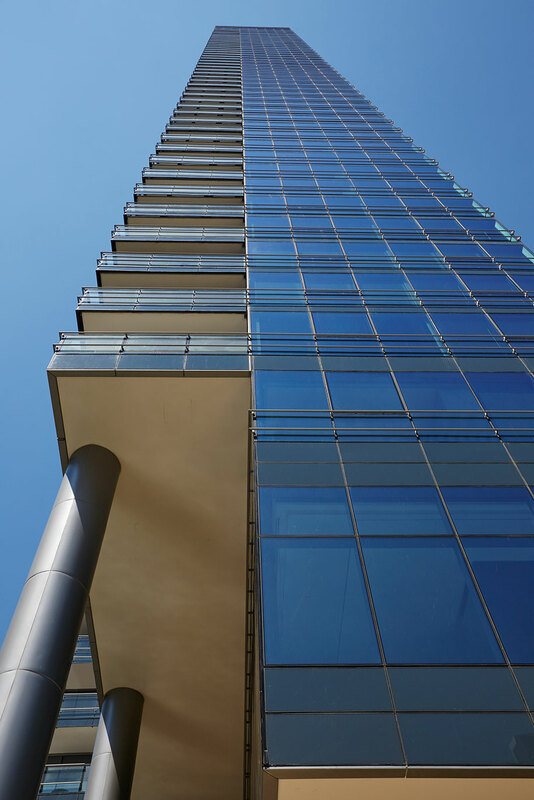 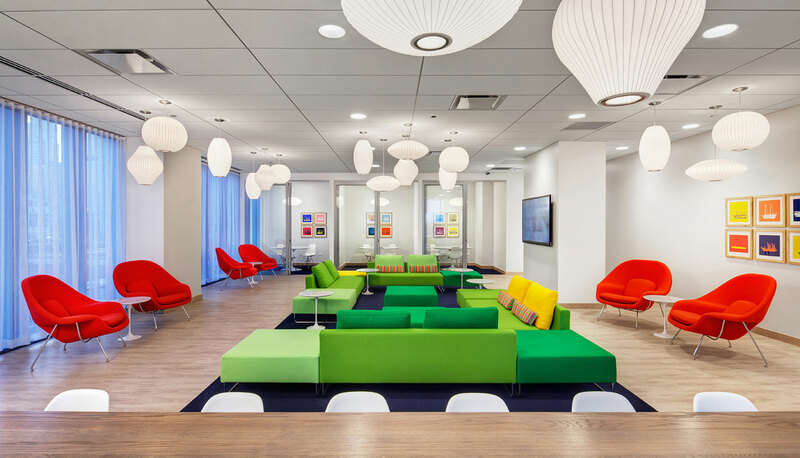 The feeling of light transforms each unit to be bright, transparent and open. 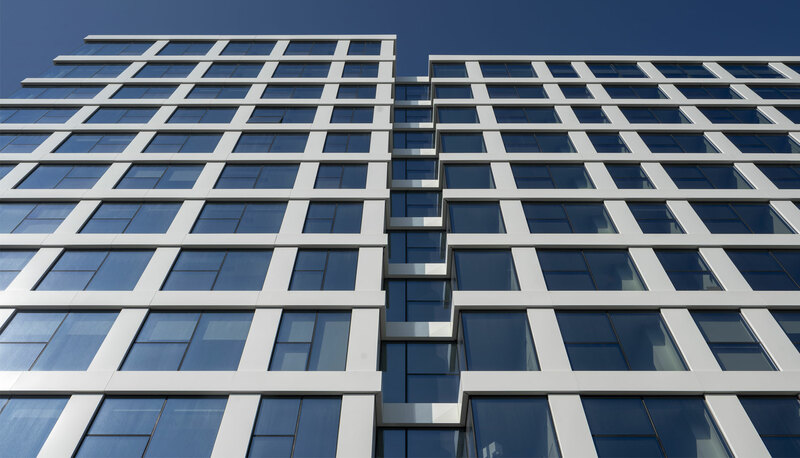 The composition of the façade responds to the layout of the individual units, providing an increased interaction between the exterior and interior. 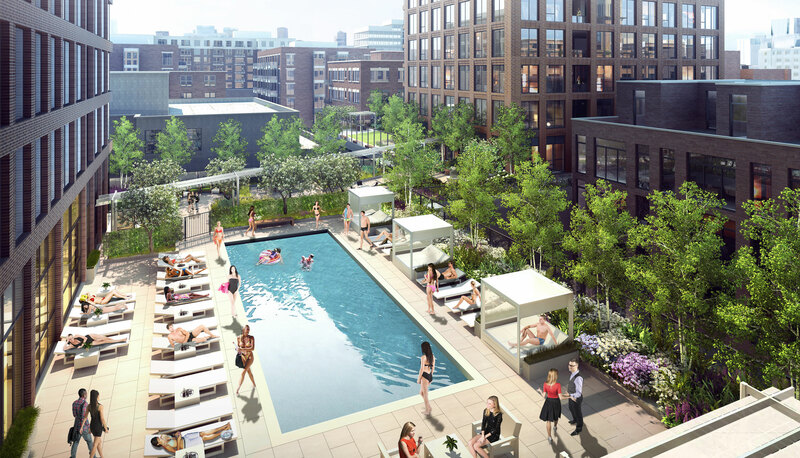 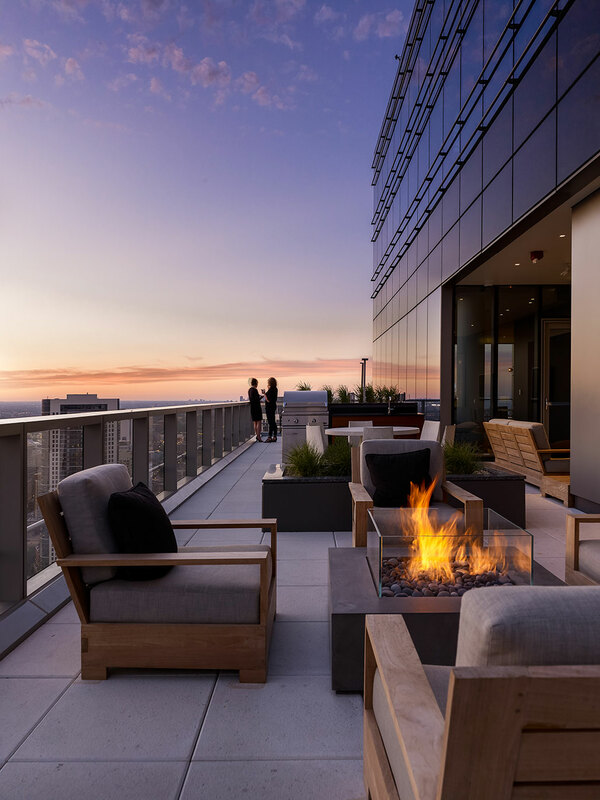 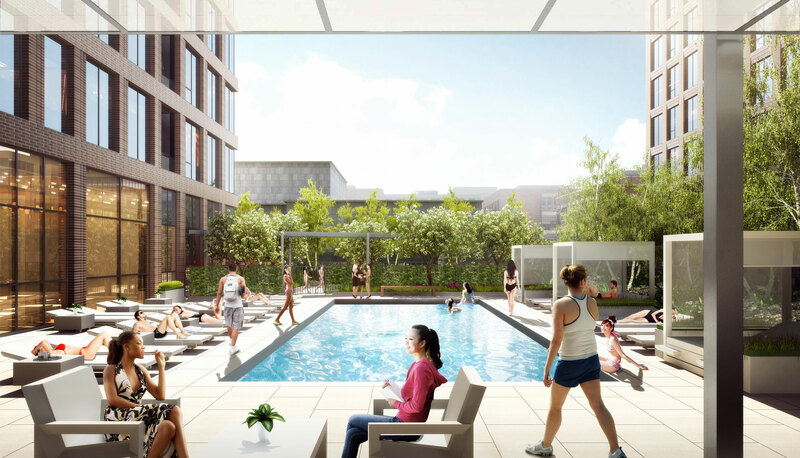 A landscaped terrace and roof pool deck provides residents a private, vibrant outdoor experience that is connected to the skyline of the city. 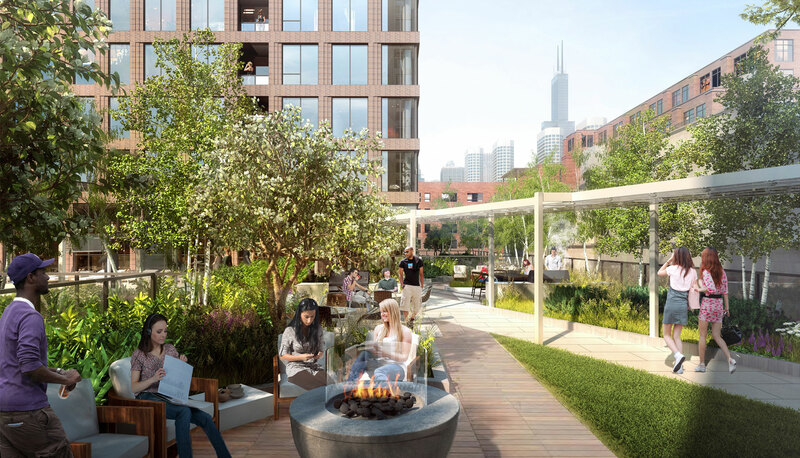 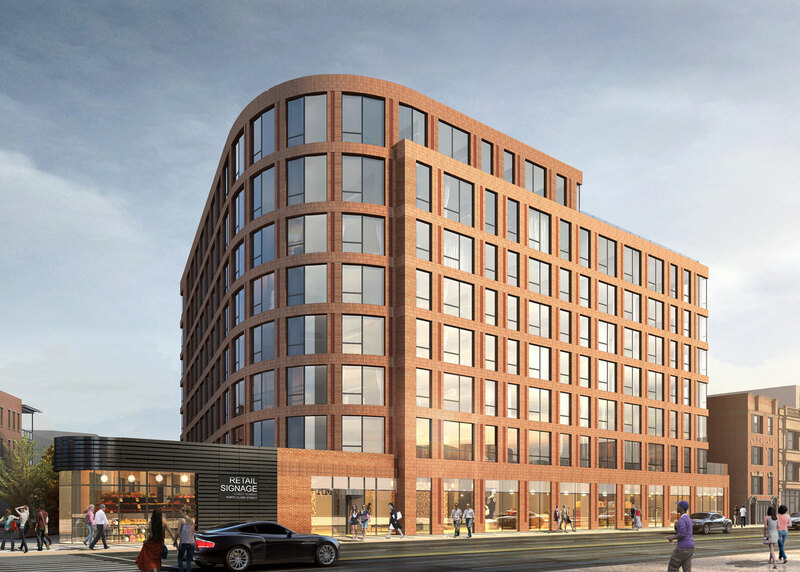 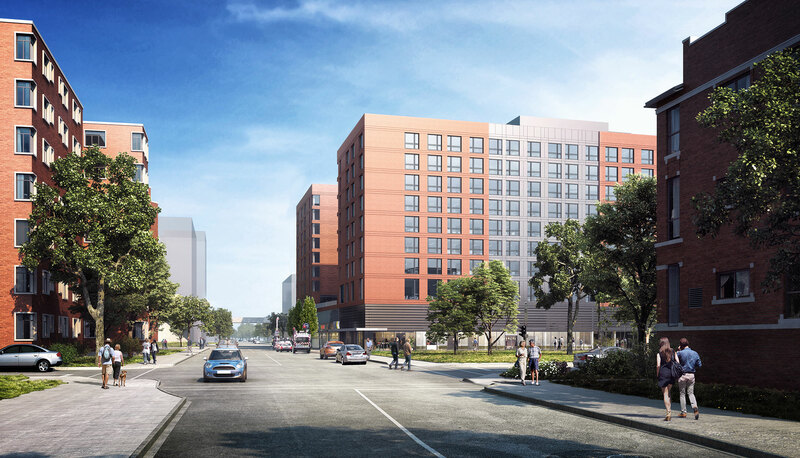 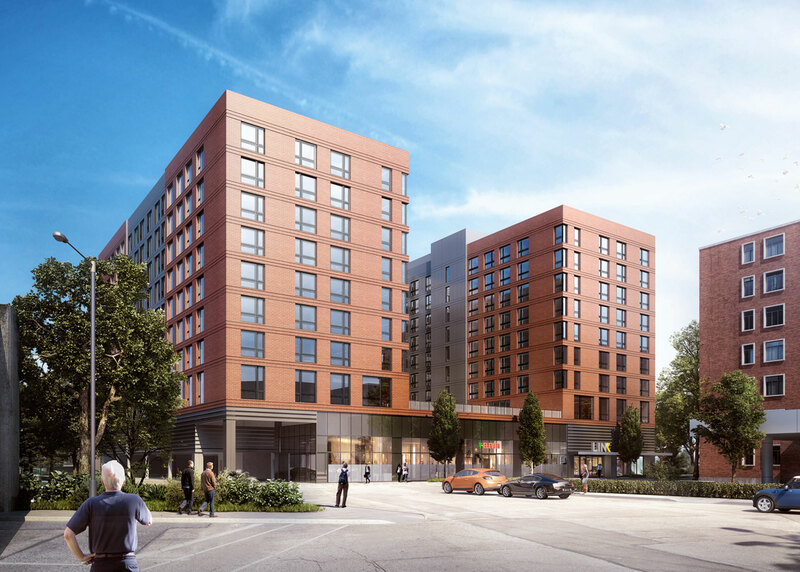 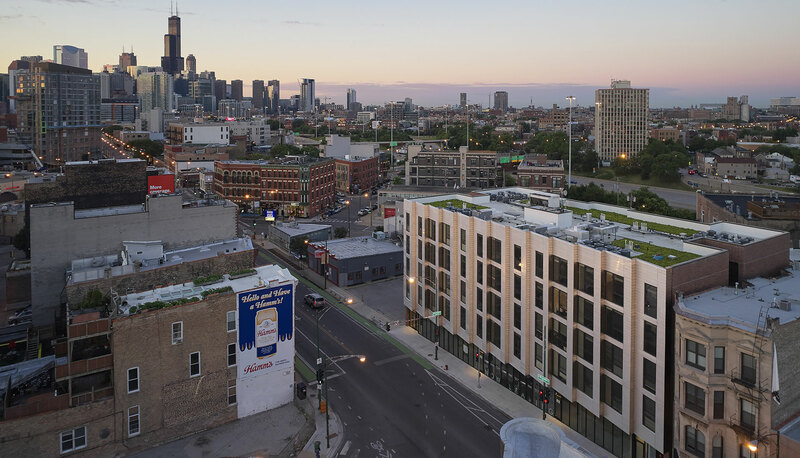 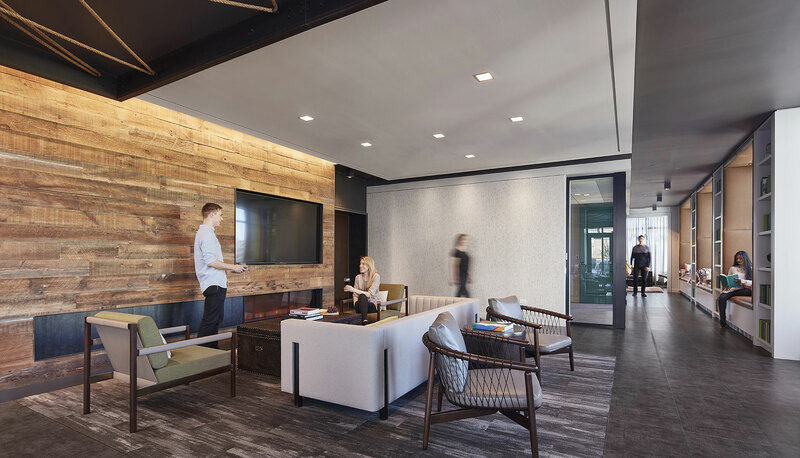 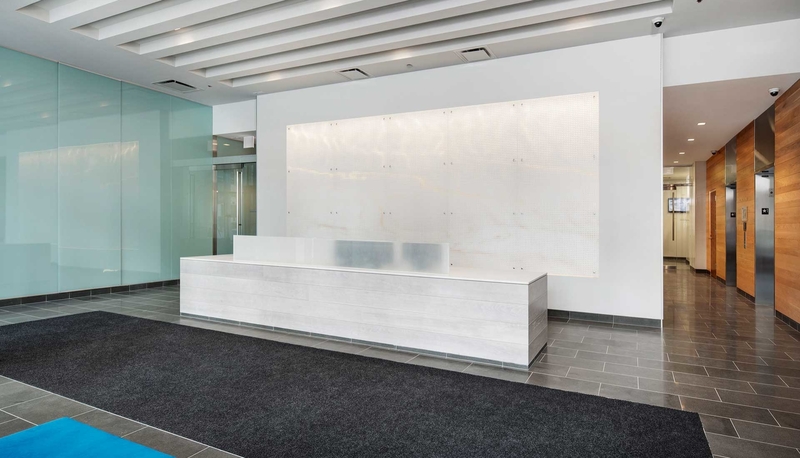 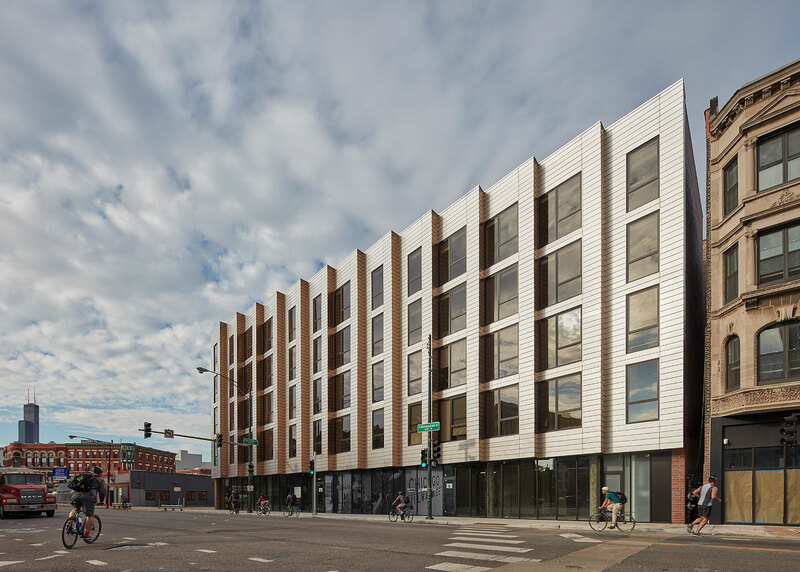 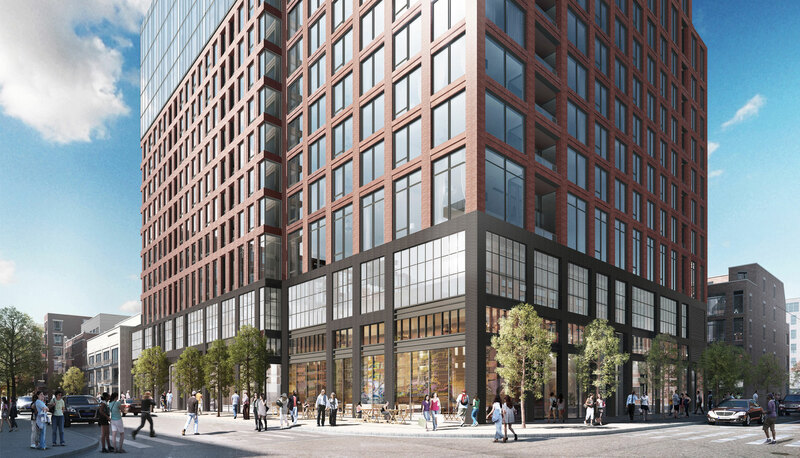 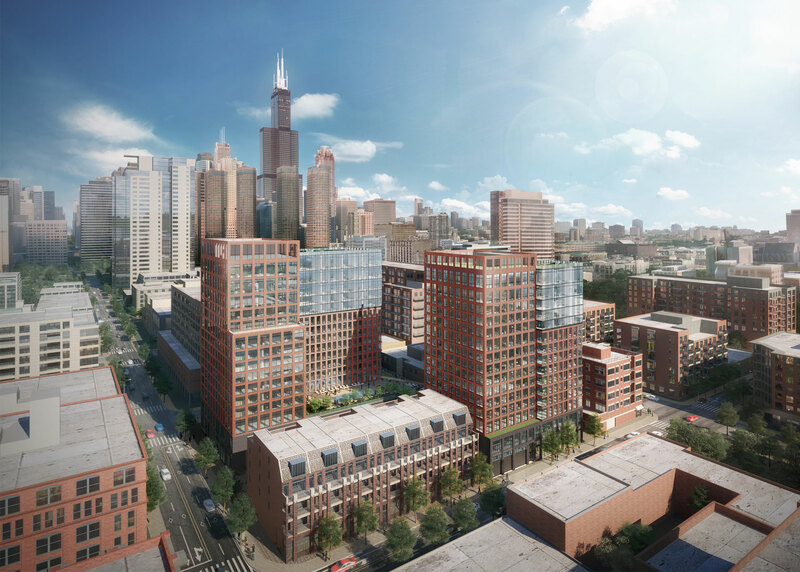 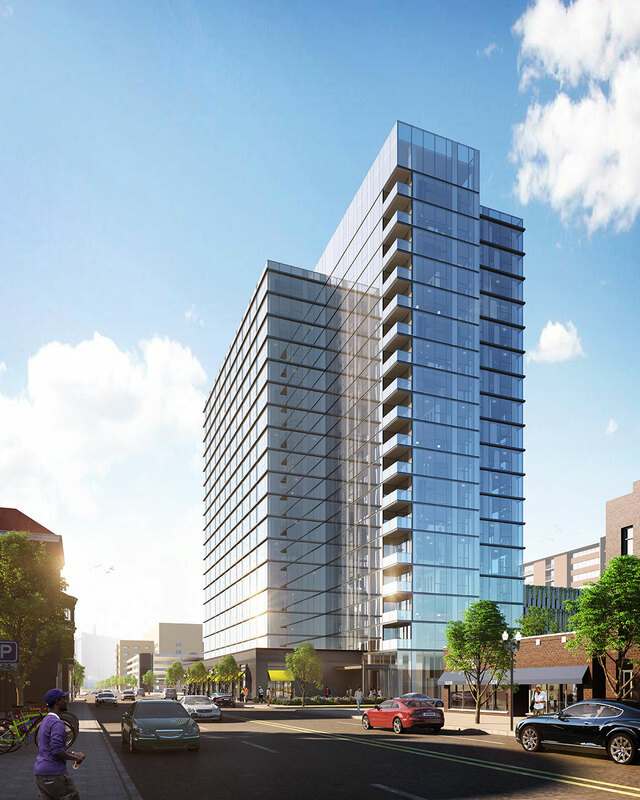 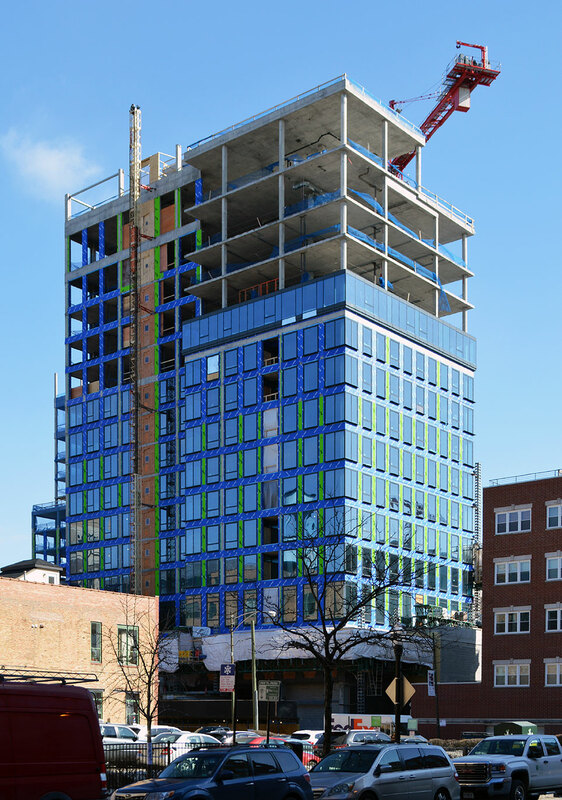 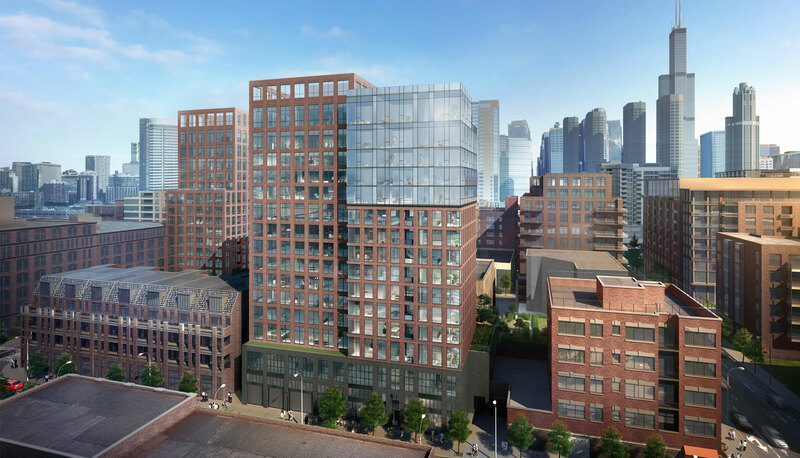 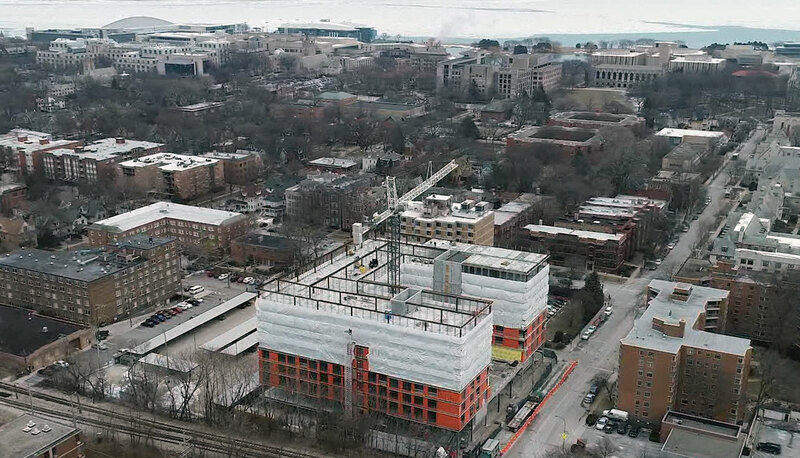 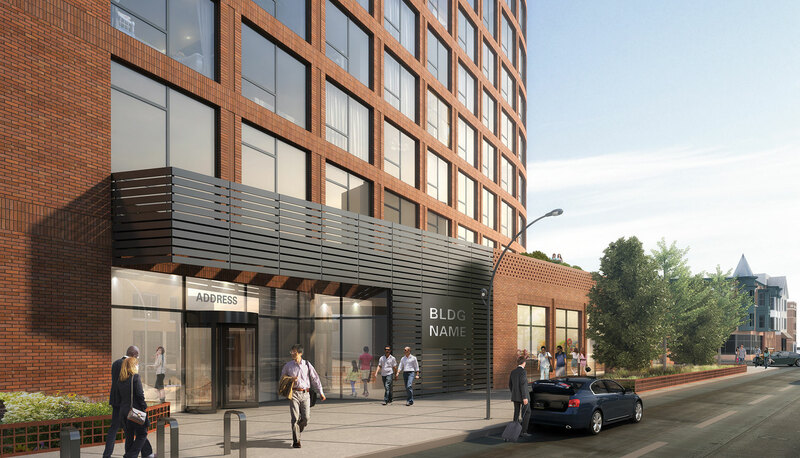 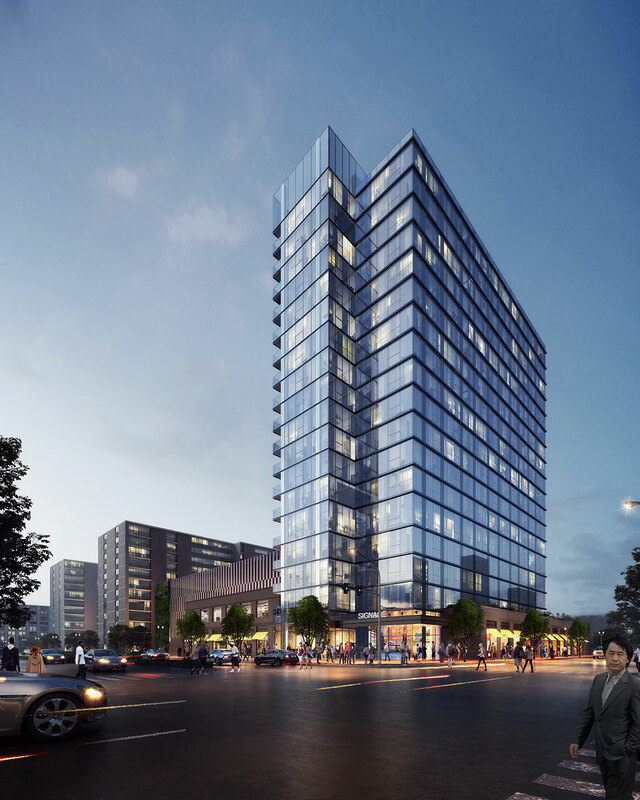 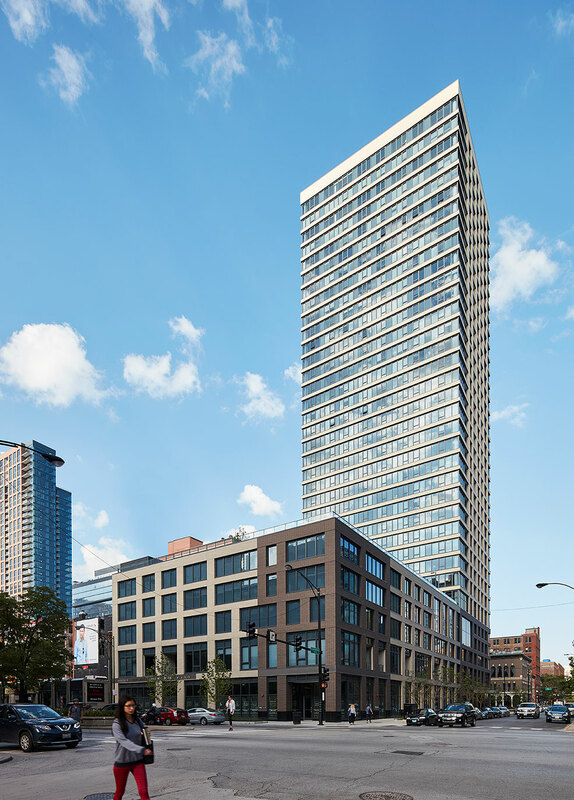 Located one block from the bustling Belmont “L” station and two blocks from the lively commercial districts of both Wrigleyville and Boystown, the 3300 N. Clark Street mixed-use project sits at the heart of Chicago’s Lakeview neighborhood. 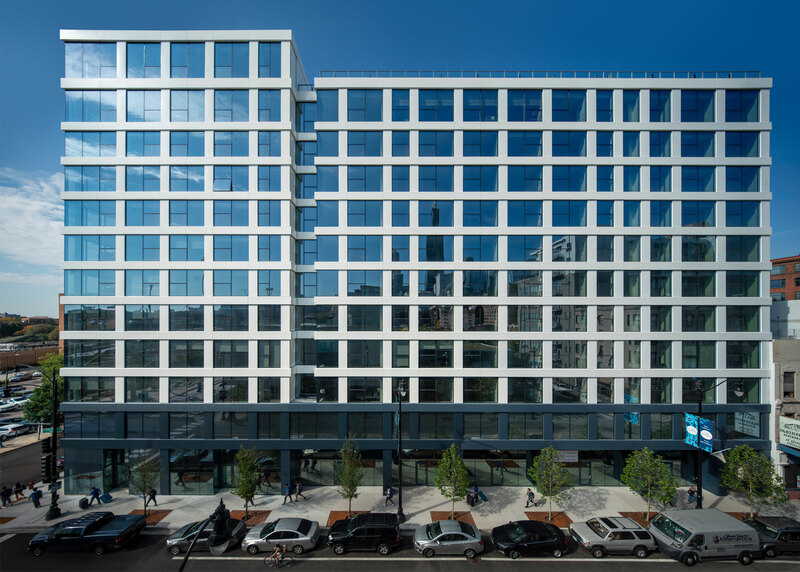 Comprised of 140 residential units, this 8-story building is set back from a landscaped roof terrace atop a retail and parking podium. 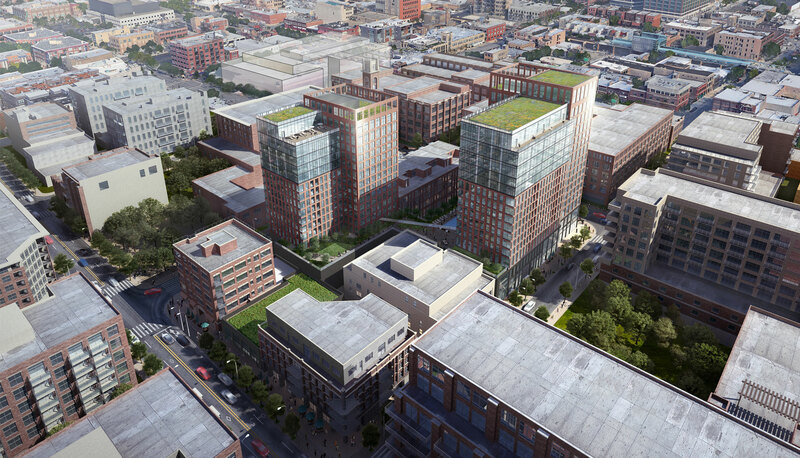 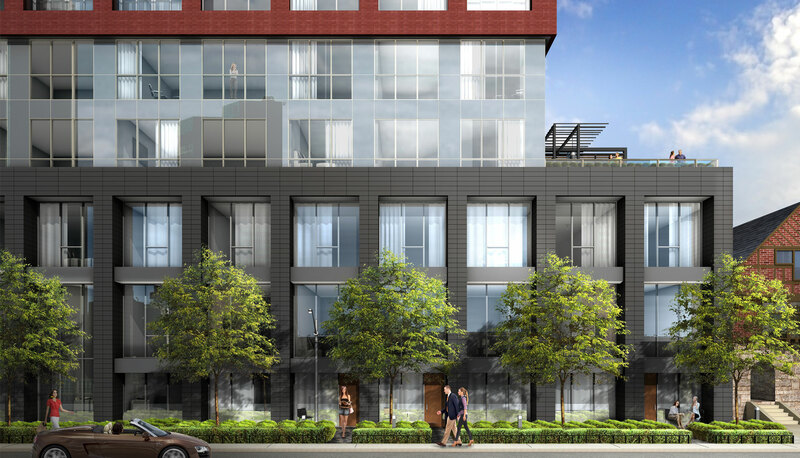 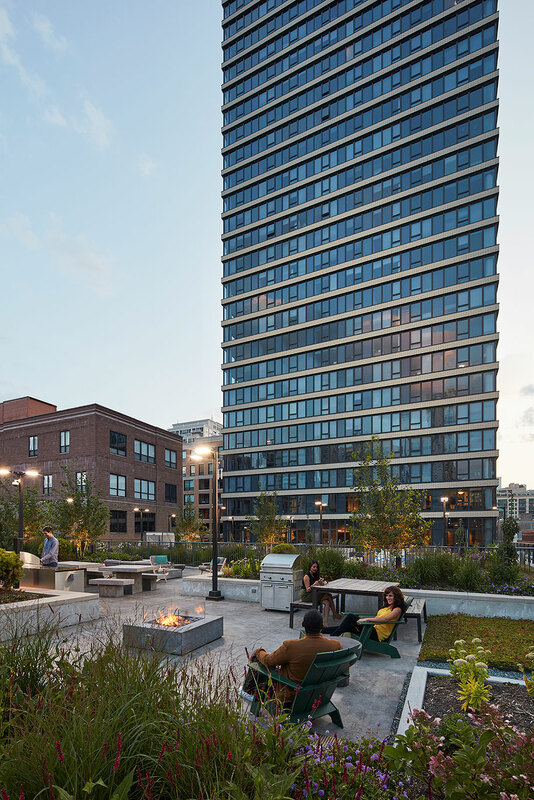 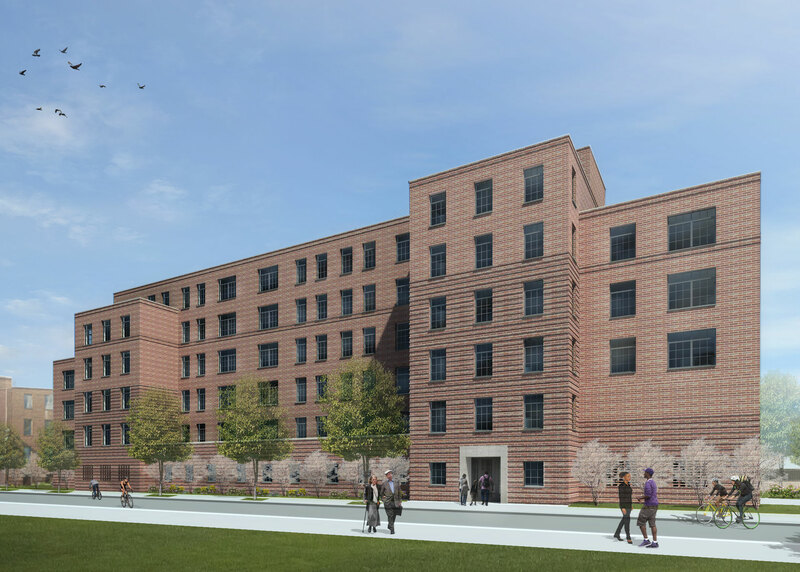 The building steps down at the north side to respond to the existing neighborhood scale, while providing additional terrace space for residents. 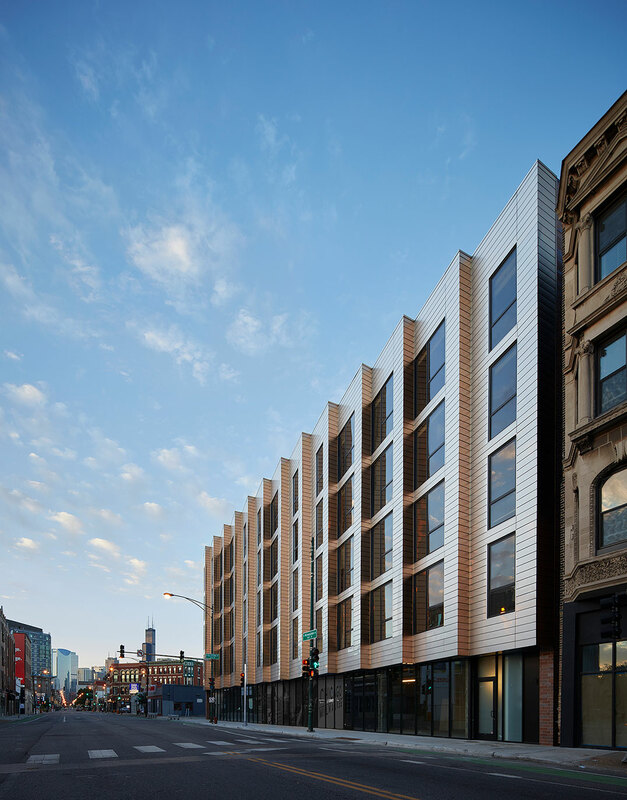 The curved face and second floor setback help to open and soften the narrow southeast corner on School Street. 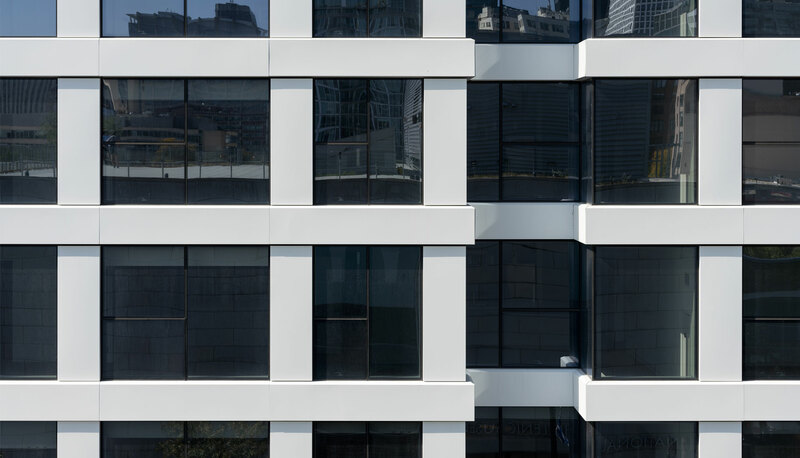 The material scale within the façade details balance the building with adjacent context. 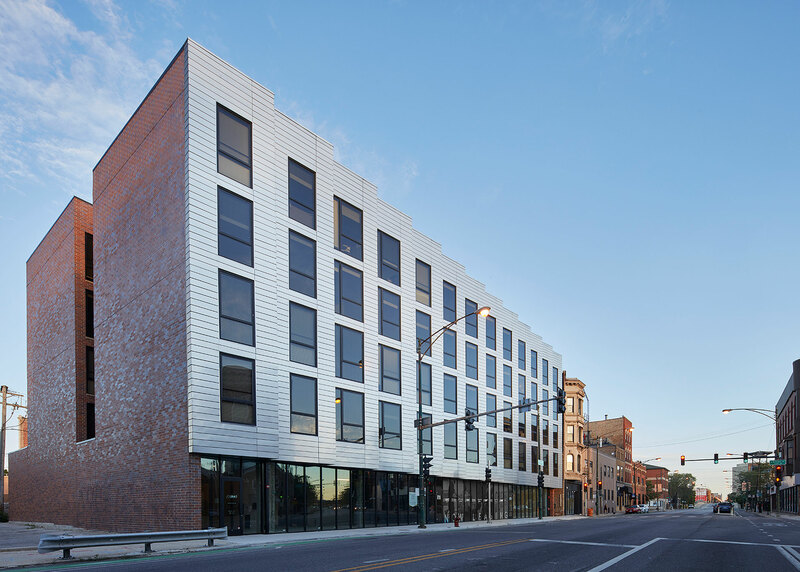 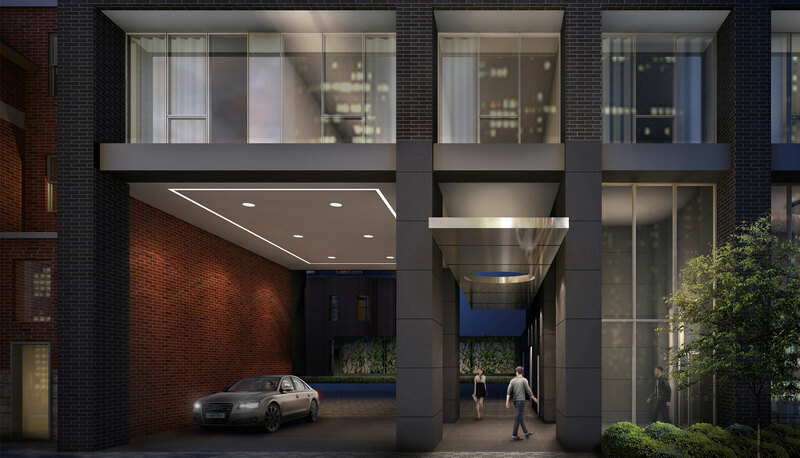 The brick and glass materiality speak to the neighborhood’s quality and feel.